The dendritic structure of stream channels reflected in network position and stream order (Figure 1.2), the hierarchical nesting of smaller habitat units within larger units (Figure 1.3), and the longitudinal gradient imposed by the unidirectional flow of water from sources to sea establish the large-scale spatial stage for river systems. As the fluvial system transitions along its length from its erosional upper reaches through its middle reaches of episodic erosion and deposition, and then to its depositional lower reaches (Schumm 1977), changes in the size and supply of sediments and the river's power (Figure 313) cause channel structure to change predictably. As important as the longitudinal axis is, rivers are of course three-dimensional systems (Figure 1.1), in which exchanges along lateral and vertical axes play vital roles (Ward 1989). A river is often conceptualized as a continuum of flowing water, but in many regions, rivers are periodically interrupted by lentic waters. The effects of dams and impoundments are well documented (Section 13 2.1.1) and include habitat fragmentation, changes to flow and thermal regimes, and altered transport of sediments, nutrients, and organic matter. The effects of a dam eventually dissipate, although often not for many tens of kilometers. Because many rivers have multiple dams, they experience repeated breaks in the river continuum, described as the serial discontinuity concept (Ward and Stanford 1983). Recovery of the river downstream of each dam depends on dam size, its position along the river network, tributary inputs, and other factors. In the case of rivers that historically were connected to extensive floodplains, dams and levees may permanently sever lateral connectivity (Ward and Stanford 1995), resulting in the loss of critical ecosystem functions. Less attention has been paid in river ecology to the natural interruptions that result when chains of lakes occur along a river's course. Lakes may have modest effects on dispersal, flow, and temperature relative to dams, but considerable influence on suspended and dissolved material in transport. A study of a chain of small lakes interspersed among river segments in Alaska's North Slope found that streams exported most ions and dissolved nutrients to lakes, whereas lakes exported dissolved organic carbon (C) to streams (Kling et al. 2000, Larson et al. 2007). In general, lakes are expected to retain particulates due to settling, and nutrients because of biological utilization, but results to date reveal considerable variation in patterns among lake chains (Soranno et al. 1999). The position of lakes along the river continuum also influences lake chemistry; lakes high in the catchment tend to be precipitation dominated whereas lakes lower in the landscape receive more groundwater inputs (Soranno et al. 1999). Although the river is indeed a continuum, lakes and impoundments along with tributary inputs and abrupt changes in topography may all result in discontinuous change of critical variables along a river's length. Lateral connectivity at the aquatic-terrestrial boundary is an important and somewhat neglected dimension of river systems, due partly to an emphasis on small streams rather than large rivers and partly to the fact that lowland rivers in developed regions have been extensively modified. Although river-floodplain interactions are not limited to rivers of any size or region, large tropical rivers that have an annual flood cycle, flow through low-lying topography and remain largely unregulated, such as the Orinoco and Amazon Rivers of South America, provide excellent case studies. 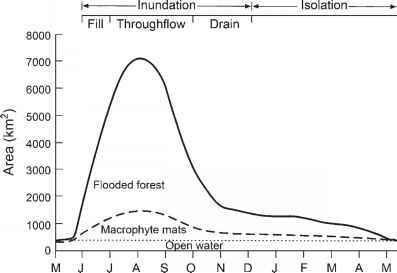 The period of flooding, which includes distinct phases of lateral inundation, throughflow of intermingled river and floodplain water, and drainage, can last several months and be highly predictable in timing and duration (Figure 14.1). In other river systems including those not in the tropics, the timing of flooding may be less predictable and rivers may not overflow their banks, and so the effect is more of a "flow pulse'' (Puckridge et al. 1988). Tockner et al. (2000) argue that flood-plains may be more common in the upper and middle reaches of temperate rivers, where floods are shorter and less predictable than in lowland tropical rivers but the expansion and contraction in discharge nonetheless still plays an important ecological role. Vertical connectivity is the third important spatial dimension of rivers. Groundwater enters stream channels along multiple flow paths, both deep and shallow, which vary with rainfall, soil moisture, and season, and result in distinctive signatures in their chemical constituents, including nutrients and DOC. Especially in gravel-bed rivers with substantial subsurface connectivity, the hyporheic zone is a third habitat dimension which harbors a diverse meiofauna and provides relative safety to eggs of fish and invertebrates. Conditions within the sediments can be particularly important to nutrient cycling because of their role in abiotic uptake and especially because patches that differ in the availability of oxygen and organic matter determine the opportunities for nitrogen (N) transformations that influence how N is used within and possibly lost from the stream. 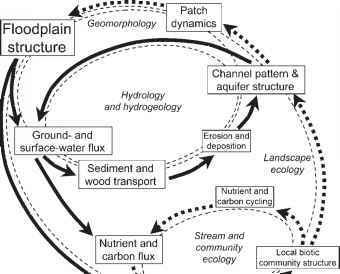 are the subject of different academic disciplines; however, the integration of these elements is critical to a full understanding of lotic ecosystem structure and function (Figure 14.2). In addition, landscape constraints on the physical structure of a stream ecosystem will determine which processes have local preeminence. For example, when lateral connectivity is high, the stream system will be strongly influenced by floodplain interactions, when vertical connectivity is high the stream system will be strongly influenced by interactions with the hyporheos, and when both lateral and vertical connectivity are constrained the stream will be most strongly influenced by upstream processes and by interruptions due to lakes and dams. Community Assembly is Determined by the Species Pool particular location and survive in the habitats that it affords (Section 10.3.2). Many species play ecologically similar roles, and chance determines which hold sway at any particular moment. On the other hand is the view that biological communities have repeatable structure that results not only from environmental factors, but also from the interactions among species, including certain key species. For many years, researchers emphasized local-scale processes centered on niche relationships and species interactions operating within closed systems, but interest has increasingly shifted toward consideration of the regional species pool, and the importance of dispersal and colonization in linking local to regional processes. The metacommunity viewpoint is one in which spatially segregated assemblages of species develop in distinct patches that may or may not be similar in their environmental conditions (Leibold et al. 2004). Metacommunities are connected by dispersal, just as is the case for their individual populations. Although similar in many ways to the older patch dynamics perspective (Townsend 1989), the metacommunity perspective incorporates trade-offs between species not only in the typical dimensions such as resource use, but also, for example, between local resource utilization and colonization success. 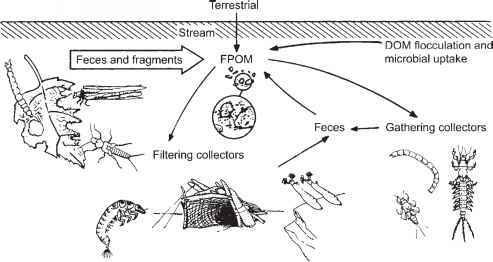 The stream environment is heterogeneous across all spatial and temporal scales. Individual habitat patches typically are distinctive in their environmental conditions including current, substrate, temperature, organic matter accumulations, biofilms, and so forth. Many species will differ in how well they are suited to particular conditions along an environmental gradient (Figure 5.5), and because multiple environmental gradients exist, species sorting along environmental gradients is likely to play a significant role in determining local abundances. Fluvial environments also are subject to a considerable degree of temporal instability, particularly from hydrologic disturbance, and so patch residency by populations and assemblages must often be short. In some situations there may be a reasonably well-defined series of stages in patch development, as seems true of desert streams subject to episodic flash flooding. In other cases, the image of a shifting mosaic of patch types, perhaps more typical of gravel-bed streams, may be more appropriate. Regardless, it is evident that dispersal and colonization are important to the long-term presence of species and assemblages. Species that succeed in a given environment and particularly those that become very abundant must possess traits that enable them to excel at utilizing resources, avoiding enemies, and resisting stresses (Tilman 1982). This also is evident in the differential success of invasive species, where most have limited influence on receiving communities and a relatively few have wide impact (Section 13 2.2). At the other extreme there may be species that persist primarily because they are adept at colonizing short-lived environments. When two outdoor experimental channels in southern England were flooded and allowed to become colonized, they accumulated 35 taxa in 1 month (Ladle et al. 1985, Pinder 1985). On day 16 the midge Orthocladius calvus completely dominated the channels, and by day 37 it had virtually disappeared. Remarkably, this was an undescribed species, in a region where the Chironomidae are relatively well known. Between the extremes of the few species that dominate across many locations and inferior competitors that are quickly displaced, there may be many species that exhibit trade-offs between their abilities to reach new environments and their success once they are established. One consequence may be a decline in assemblage similarity with increasing distance between sites, as reported in a study of New Zealand streams and attributed to distance limitations of dispersal (Thompson and Townsend 2006). An emphasis on the importance of the regional species pool on local community assembly (Figure 1.5) obviously is in accord with the hierarchical view of physical habitat within the stream network (Figure 1.3). However, although it is attractive to visualize a hierarchical series of filters, this concept is largely untested in fluvial systems, and the best evidence to date is that filters at the microhabitat scale are most influential (Lamouroux et al. 2004). Furthermore, as a counterpoint to concepts that emphasize the roles of the regional species pool and colonization dynamics, species interactions within lotic assemblages unquestionably can be strong (Figures 911 and 915). A complete understanding of what forces determine local assemblages will need to invoke species interactions as well as species sorting according to the match between traits and environment. This will be subject to the constraints imposed by a modest number of species that, due to their abundance or their interaction strength, modify the opportunities for other species to persist. But environmental conditions often are short-lived in running waters, and so the ability to colonize and reestablish populations will almost invariably be an important dimension for lotic assemblages.